Some people class the bassinet as a ‘nice to have but not essential’ baby item. I’m not one of those people. 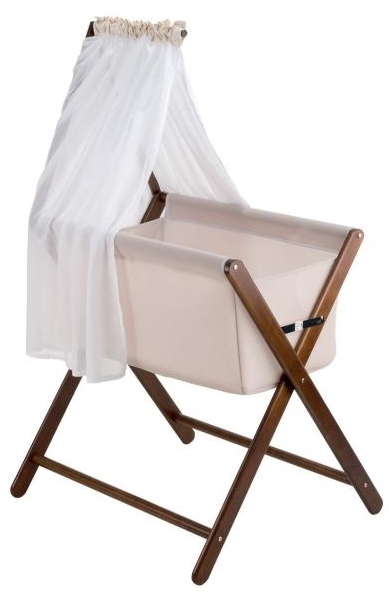 I found having a bassinet invaluable with all four of my children (I used a traditional basket-style bassinet for the first two and a cradle for the second two). The main advantage was being able to move a sleeping baby from room to room – you can’t do that with a cot. My babies would have their daytime naps in the nursery and sleep at night in my bedroom and I simply wheeled the bassinet between rooms. I also found that the height of the bassinet saved me from bending over while settling the baby, important given that I had caesareans. Here’s a quick round up of some of the bassinets and cradles that we have reviewed in the past year. 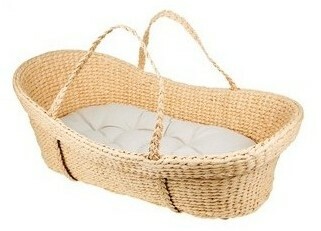 If you’re after a Moses basket, the most ‘portable’ of bassinets, take a look at the beautiful range at Bebelicious. The stunning fabrics and different stand designs are irresistible – my favourites are the pretty Hydrangea Heaven design and the cool Mint Julep print (shown above). 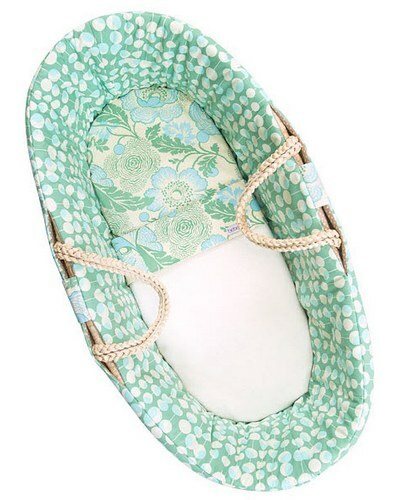 For a simple Moses basket, the Nature Baby design from Ecobabe will fit well in any nursery and is also an eco-friendly choice, being made from sturdy but biodegradable natural paper rope (shown above). Newcomer to the nursery sleep-scene is the divine Bassinet Harmony from Baby Björn. It’s packed with features including mesh fabric for good airflow, a lightweight design (just five kilos) and springy legs which mean your baby’s own movements will start the bed gently rocking. Multi-task with the Hauck i’coo Grow with Me 1-2-3 set. The clever three-in-one piece comprises an ultra-lightweight frame with bassinet, bouncer and highchair attachments. Use as a sleeping vessel and bouncer for those first months of life and graduate to the highchair once baby is ready to sit up and eat. 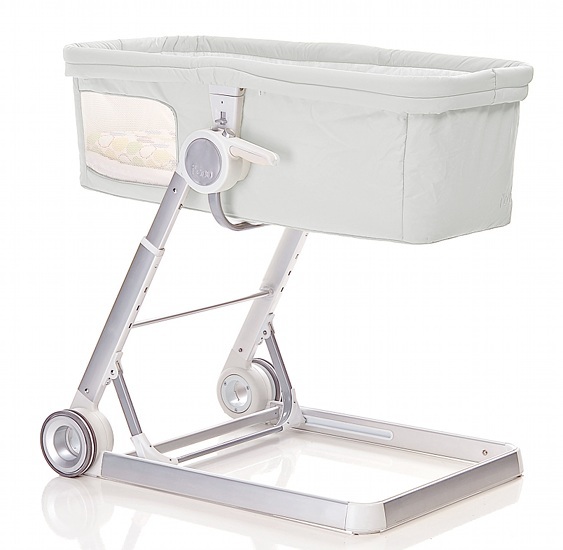 The Hauck has recently become available in Australia (bassinet shown above). My personal favourite is the superb Hop! Hop! Hop! 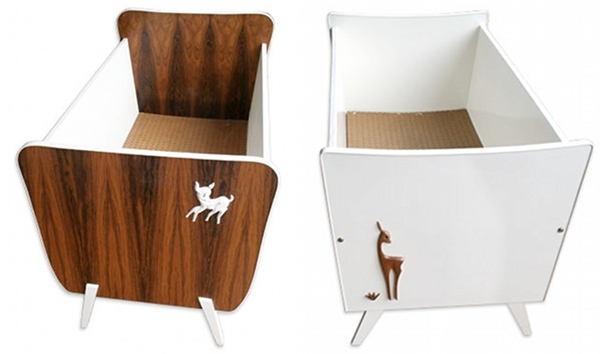 bassinet by French designer Castor & Chouca. Made of bamboo slats and plexiglass the bassinet is inspired by the utilitarian models used in hospitals. 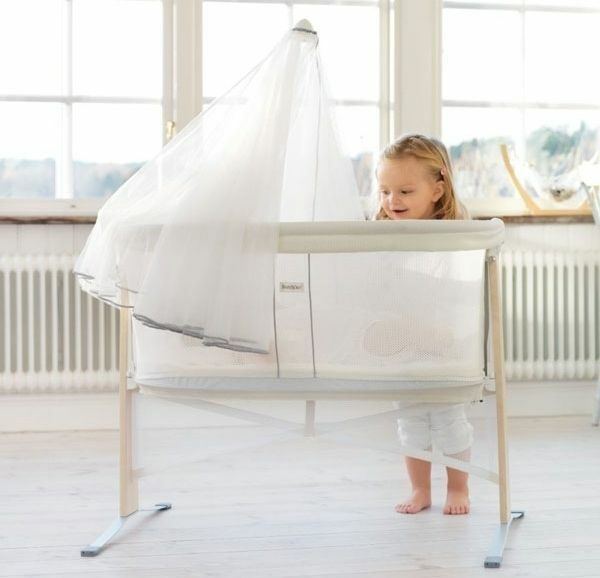 Twins don’t miss out – the amazing So-Ro Cradle designed by Norwegian occupational therapist Ane Lillian Tveit is designed for two (although a single cradle is also available). The unique design allows the cradle to be rocked forwards as opposed to side-to-side or lateral, like most cradles. This is because the brain registers a rhythmic forward movement as soothing, much like sitting on a swing. 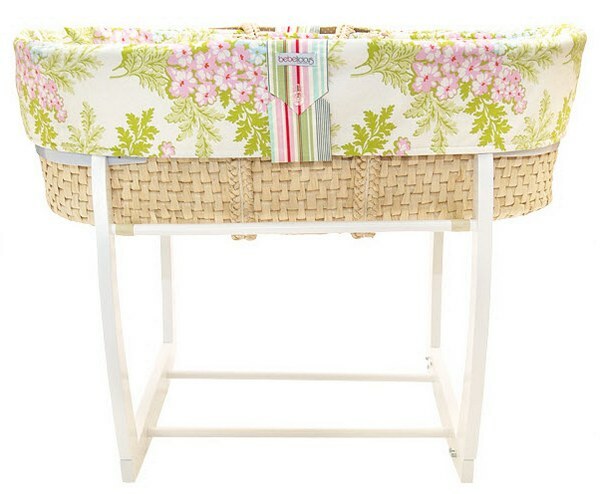 Our round up wouldn’t be complete without including some bassinets and cradles strictly for the ‘I wish…’ list. The first are these retro beauties from Dutch store De Oude Speelkamer. There’s also the breathtaking hand-crafted Radiating Cradle by Swedish architect/designer Jonas Lindvall. Made exclusively to order, one hundred and twenty pieces of walnut are carefully hand-planed, bonded and sanded to ensure the true beauty of the wood is captured. 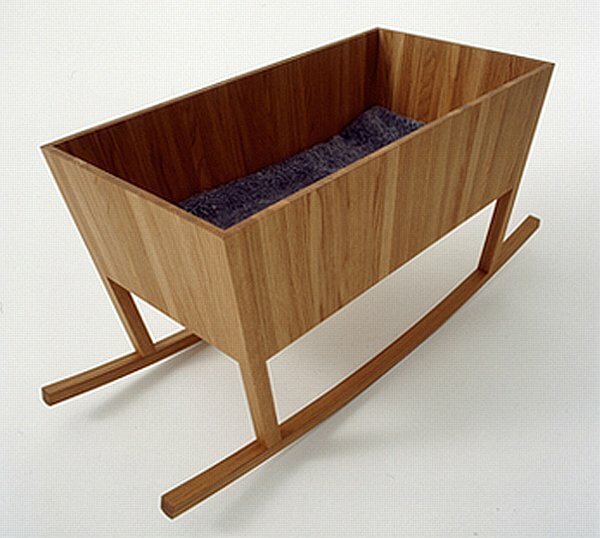 Save your pennies though, each cradle is £1,950. Seen something here you love? Add it to your Wishlist or check out more options on the Babyology Chooser. 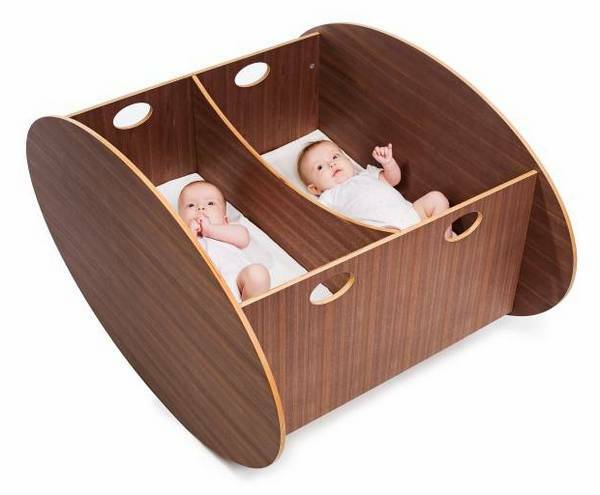 An affordable and attractive choice is the Mother’s Choice Coco bassinet – choose from Baltic, White and Walnut, from Wayfair.